Haas, F. 1929. Bemerkungen über mittelamerikanische najaden. Senckenbergiana 11: 310-344. Blainville, 1825, Manuel Malacol. et Conch. : 538. Bory de St. Vincent, 1827, Encycl. Méth. : 147. Menke, 1828, Syn. Method. Moll. : 63. Menke, 1830, Syn. Method. Moll. : 106. Lea, 1834, Trans. Amer. Phil. Soc. : 93.
d’Orbigny, 1835, Mag. Zool. : 43. Lea, 1836, Synopsis Fam. Naiades: 53. Swainson, 1840, Treat. Malacol. : 287. Hanley, 1843, Illustr. Descr. Cat. Rec. Bivalve Shells: 220. Lea, 1852, Synopsis Fam. Naiades: 52. Hupé, 1857, [in] Castelnau, Amim. Nouv. Rares d’Amer. Sud: 85. Adams & Adams, 1857, Gen. Rec. Moll. : 504. Lea, 1870, Synopsis Fam. Naiades: 82. Ihering, 1893, Arch. Naturg. : 135. Corsi, 1900, Anais Mus. Nac. Montevideo: 456. Marshall, 1915, Proc. U.S. Nat. Mus. : 529. H.B. Baker, 1930, Occ. Pap. Mus. Zool. Univ. Mich.: 70. Morretes, 1949, Arqu. Mus. Paranaense: 27. Anodonta grandis grijvalvae Haas, 1929. ‘Morelet’ Haas, 1929, Senckenbergiana: 319. ‘Lea’ Haas, 1929, Senckenbergiana: 333. Elliptio (Nephronaias) hermanni Haas, 1929. Haas, 1929, Senckenbergiana: 323, figs. 12-13..
Haas, 1969, Das Tierreich: 194. Type(s): TYPE SMF_3488, Mexico: Arroyo Limón, Staat Tabasco. Elliptio (Popenaias) popei var. regalis Haas, 1929. ‘Pilsbry’ Haas, 1929, Senckenbergiana: 330 [nomen nudum]. Lampsilis (Friersonia) coyensis var. vallesensis Haas, 1929. ‘Pilsbry’ Haas, 1929, Senckenbergiana: 317 [nomen nudum]. Haas, 1929, Senckenbergiana: 339, figs. 20-21. 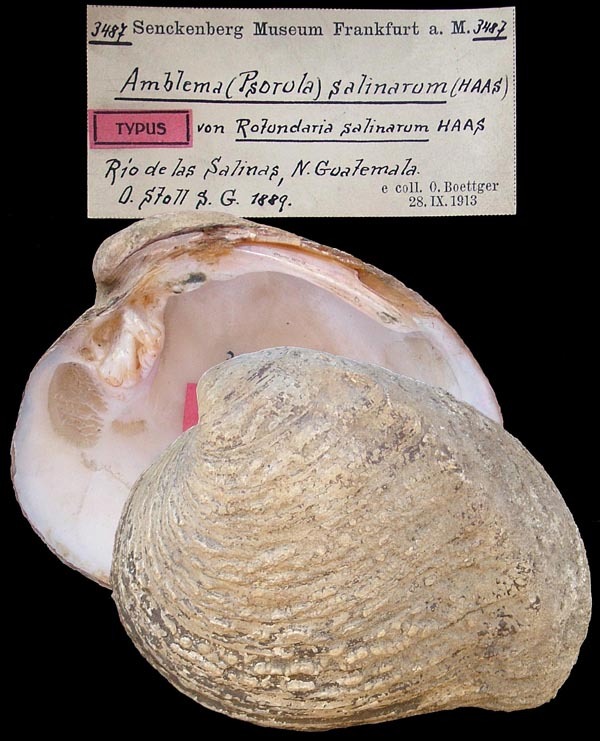 Type(s): HOLOTYPE SMF_3487, Rio de las Salinas, N. Guatemala. Simpson, 1900, Proc. U.S. Nat. Mus. : 702. Simpson, 1914, Descr. Cat. Naiades: 591. ‘Dunker’ Haas, 1929, Senckenbergiana: 321. Anodonta chapalensis Crosse & Fischer. — Haas (1929: 319). Anodonta coarctata (Anton). — Haas (1929: 319). Anodonta grandis globosa Lea. — Haas (1929: 319). Anodonta grandis grijvalvae [sic] Morelet. — Haas (1929: 319). Anodonta richardsoni Martens. — Haas (1929: 319). Anodontites cylindracea (Lea). — Haas (1929: 343). Anodontites trapezialis [sic] bridgesii (Lea). — Haas (1929: 343). Anodontites trapezialis [sic] glaucus (Valenciennes). — Haas (1929: 340). Anodontites trapezialis [sic] sinaloensis (Crosse & Fischer). — Haas (1929: 340). Crenodonta digitata (Morelet). — Haas (1929: 333). Crenodonta nickliniama [sic] (Lea). — Haas (1929: 333). Crenodonta stolli (Martens). — Haas (1929: 333). Elliptio (Barynaias) liebmanni (Philippi). — Haas (1929: 330). Elliptio (Barynaias) pigerrimus (Crosse & Fischer). — Haas (1929: 331). Elliptio (Barynaias) plexus (Conrad). — Haas (1929: 331). Elliptio (Barynaias) sallei (Crosse & Fischer). — Haas (1929: 331). Elliptio (Micronaias) aratus (Lea). — Haas (1929: 332). Elliptio (Micronaias) fallaciosus (Simpson). — Haas (1929: 332). Elliptio (Micronaias) granadensis (Lea). — Haas (1929: 332). Elliptio (Nephronaias) aeruginosus (Morelet). — Haas (1929: 322). Elliptio (Nephronaias) averyi (Lea). — Haas (1929: 320). Elliptio (Nephronaias) aztecorum (Philippi). — Haas (1929: 329). Elliptio (Nephronaias) calamitarum (Morelet). — Haas (1929: 323). Elliptio (Nephronaias) copanensis (Marts.). — Haas (1929: 322). Elliptio (Nephronaias) dysonii (Lea). — Haas (1929: 321). Elliptio (Nephronaias) goascoranensis (Lea). — Haas (1929: 321). Elliptio (Nephronaias) gundlachi (Dunker). — Haas (1929: 328). Elliptio (Nephronaias) hermanni n. sp. — Haas (1929: 323). Elliptio (Nephronaias) macnielii (Lea, 1869). — Haas (1929: 320). 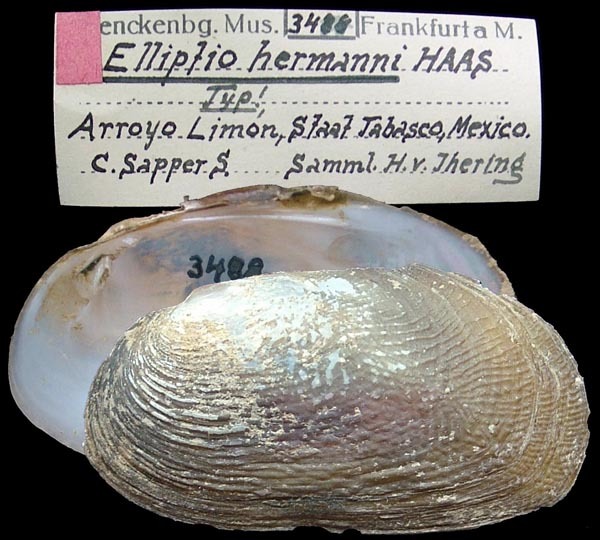 Elliptio (Nephronaias) mexicanus (Philippi). — Haas (1929: 327). Elliptio (Nephronaias) ravistellus (Morelet). — Haas (1929: 328). Elliptio (Nephronaias) rowellii (Lea). — Haas (1929: 321). Elliptio (Nephronaias) rugulosa (Charpentier in Küster). — Haas (1929: 323). Elliptio (Nephronaias) scamnatus (Morelet). — Haas (1929: 328). Elliptio (Nephronaias) sphenorhynchus (Crosse & Fischer). — Haas (1929: 327). Elliptio (Nephronaias) tabascoensis (Charpentier in Küster). — Haas (1929: 322). Elliptio (Nephronaias) verae-pacis (Tristram). — Haas (1929: 328). Elliptio (Nephronaias) yzabalensis (Crosse & Fischer). — Haas (1929: 324). Elliptio (Popenaias) metallicus var. ganinus (Pilsbry). — Haas (1929: 330). Elliptio (Popenaias) popei (Lea). — Haas (1929: 330). Elliptio (Uniomerus) tetralasmus (Say). — Haas (1929: 320). Lampsilis (Actinonaias) medellina (Lea). — Haas (1929: 314). Lampsilis (Cyrtonaias) explicata (Morelet). — Haas (1929: 314). Lampsilis (Cyrtonaias) microdon (Marts.). — Haas (1929: 313). Lampsilis (Cyrtonaias) tampicoensis (Lea). — Haas (1929: 313). Lampsilis (Cyrtonaias) tampicoensis berlandierii (Lea). — Haas (1929: 313). Lampsilis (Cyrtonaias) umbrosa (Lea). — Haas (1929: 313). Lampsilis (Delphinonaias) delphinulus (Morelet). — Haas (1929: 317). Lampsilis (Delphinonaias) planivalvis (Morelet). — Haas (1929: 317). Lampsilis (Disconaias) discus (Lea). — Haas (1929: 314). Lampsilis (Disconaias) fimbriata Frierson. — Haas (1929: 314). Lampsilis (Disconaias) purpuriatus (Say). — Haas (1929: 315). Lampsilis (Friersonia) coyensis (Pilsbry). — Haas (1929: 317). Lampsilis (Friersonia) iridella (Pilsbry & Frierson). — Haas (1929: 316). Lampsilis (Friersonia) signata (Pilsbry). — Haas (1929: 316). Lampsilis (Friersonia) undivaga (Pilsbry). — Haas (1929: 316). Pachynaias cyrenoides (Philippi). — Haas (1929: 318). Pachynaias imbricata (Mörch). — Haas (1929: 318). Pachynaias rugososulcata (Lea). — Haas (1929: 318). Pachynaias spheniopsis (Morelet). — Haas (1929: 318). Psoronaias crocodilarum [sic] (Morelet). — Haas (1929: 332). Psoronaias herrerae (Marshall). — Haas (1929: 332). Psoronaias kuxensis (Frierson). — Haas (1929: 333). Psoronaias morini (Morelet). — Haas (1929: 332). Psoronaias ostreatus (Morelet). — Haas (1929: 332). Psoronaias psorica (Morelet). — Haas (1929: 332). Psoronaias semigranosa (vondemBusch). — Haas (1929: 332). Psoronaias testudinea (Morelet). — Haas (1929: 332). Rotundaria percompressa (Martens). — Haas (1929: 334). Rotundaria profunda (Simpson). — Haas (1929: 339). Rotundaria quadrata (Simpson). — Haas (1929: 334). Rotundaria rudis (Simpson). — Haas (1929: 339). Rotundaria salinarum n. sp. — Haas (1929: 339). Rotundaria usumacintae (Crosse & Fischer). — Haas (1929: 339).